Yesterday after I published my vegan month of food post, I realized that I had cheated, I posted a recipe with A followed by two with B. And now I have a recipe for D as in Donauwelle to share. I skipped the C for valid reasons though. C is not used in German words, we use K instead. We use the letter C in some foreign words of Latin or Greek origin, often in combination with H as in Christstollen. And Christstollen in September? No way! (The Christmas candy at the grovcery store at this time of the year has to be enough!) That is why I left out the C.
Like Bienenstich Donauwelle is a large sheetcake. Regular and chocolate batter are layered, the cake is sprinkled with canned tart cherries and baked. Once it has cooled you top it with buttercream and chocolate. I remember that I had my first piece of Donauwelle while attending a tent camp. I had never seen this cake before and I was completely blown away by it. At first I couldn’t comprehend why our cook decided to make a cake for about 100 people. But after I made this recipe myself, I understand that this is the perfect cake for a large crowd. You get a lot of flavour for a little work, compared to what it would take you to make for example Schwarzwälder Kirschtorte for 100 people. Of course this works perfectly for smaller crowds, too. All you need in this case is a 8 x 8 inch brownie pan. For this recipe I decided to make a version of buttercream that calls for fat, sugar, and pudding. It’s quite a popular filling for many German cake recipes. For example, you can use it for the Bienenstich cupcakes. Line a 8 x 8 inch (20×20 cm) square pan with parchment paper. Preheat oven to 350°F (180°C). In a narrow bowl cream together coconut oil and sugar. Add vanilla, salt, and soy yoghurt. Carefully beat into a smooth mass, add 5 tablespoons soymilk and repeat. In a second bowl, mix flour and baking powder. Add liquid ingredients and mix well. Pour 2/3 of the batter into the pan. Mix remaining batter with 2 tablespoons of soy milk and cocoa powder. Pour over the light batter and distribute evenly. Place cherries on top and lightly press them into the batter. Bake for 40 minutes. Place sugar and starch in a small pot. Add soymilk and bring mixture to a boil, whisking constantly. Boil for about one minute until the mixture has thickened. Set aside and let cool completely. (This is a very important step. If the pudding is warm, the coconut oil will melt while beating the buttercream and your cream will turn into a soup.) Cream coconut oil (narrow container etc.) and add half of the cooled pudding. Beat until the mixture is smooth and add remaining pudding. Add powdered sugar, beat again and pour over the cake. Distribute evenly. Melt chocolate and oil, mix well. Pour over the buttercream and distribute evenly. Let set for about 10 minutes then use a fork to draw waves into the chocolate. You can place it in the fridge so that the chocolate will set faster. Remove it 1 hour before serving, so the chocolate is softer and the cake can be cut easily. I made this recipe so many times already. I love it! The other day, I made a cupcake version of this which was amazing as well. Perfect little treat to take. I layered the white cake, then cherries, then chocolate cake. I didn’t add as much coconut oil to the pudding to keep it a little further and used that for topping and then drizzled them with chocolate. Yum. 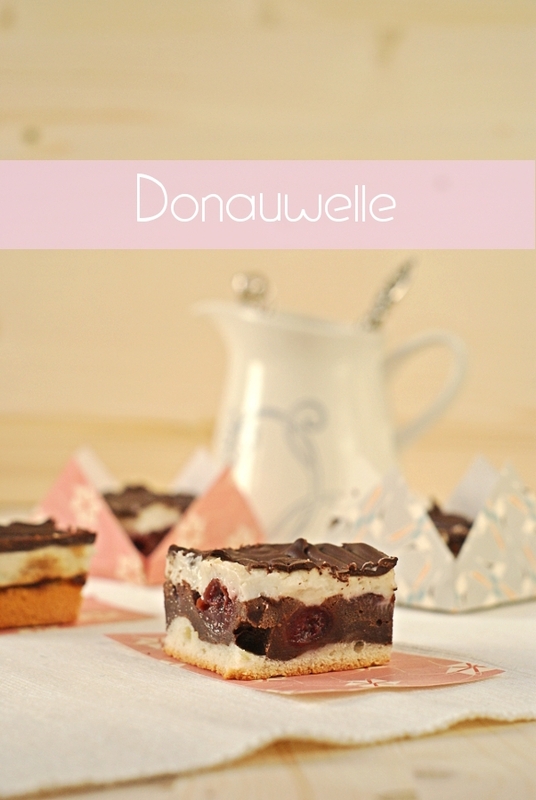 Donauwelle cupcakes? That sounds really wonderful and a great party idea. Thank you for letting me know, Kathrin. Hello! your site is WONDERFUL! I am a Canadian vegan and my partner is an omnivorous German. For his 30th birthday, I asked him what kind of cake he would want if he could have ANY cake. He said “well, I would want Donauwelle [then he described it] …but, that’s not really possible…” and i said “OH YES IT IS!” because of your site! I doubled it, and made it for our big birthday celebration and it was absolutely INCREDIBLE. He loved it so much, as did our guests, and then work colleagues that we were able to share leftovers with. Thank you very much for this recipe and all of your recipes! Thank you Cathy! That is so wonderful to hear! And adding salt to the buttercream sounds like a great idea. I always forget that! Yum! I made this for my German class and it was big hit. Luckily there was a lot of food, so i have some leftover to snack on later. I really love the pudding buttercream. So tasty and simple to make! That is awesome! I am glad you liked it. Julia, ich glaub, dir ist die Buttercreme geronnen (das heißt, dass sich das Fett und der Pudding nicht richtig verbunden haben. Weil Fett zu kalt bzw. Pudding zu warm waren) Bei der Herstellung müssen alle Zutaten etwa die gleiche Temperatur haben. Ist mir auch schon passiert :(. Da hilft leider meistens nur noch entsorgen und neu machen. Danke, Jessica! Ich wusste, dass das pasieren kann, nur nicht warum. ok, for me it didn’t work at all. I suspect the coconut oil to be the problem, so what brand do you use? Why do you think it was the coconut oil? Several people made this with different brands and it worked out for them. It would be awesome, if you could give me more information about what exactly went wrong, I’d love to help:) I use Rapunzel Kokosfett or Othüna Kokosfett. Hmm, also erstens ist der Teig bei mir irgendwie körnig (?) geworden. Ich hatte das Gefühl, dass sich besonders Zucker und Kokosfett nicht vertragen haben. Dann ist die Buttercreme bei mir nicht wirklich fest geworden, eher eine Buttersuppe und schmeckt in fertigem Zustand auch eher krisselig. Insgesamt erinnert mich der Kuchen irgendwie an kalter Hund, deshalb die Idee, dass ich das falsche Fett genommen hab. Welches Kokosfett hast Du benutzt? Rapunzel ist bei mir manchmal etwas körnig. Das gibt sich aber, sobald man es erhitzt. War der Pudding ganz kalt? Ansonsten könnte es sein, dass das Fett beim Mixen der Buttercreme wieder geschmolzen ist. Ich hätte den Kuchen samt Buttercreme noch einmal in den Kühlschrank gestellt. Oder die Buttercreme gekühlt und dann noch einmal aufgeschlagen. Tut mir leid, dass das Rezept so misslungen ist! Ist ja nicht deine Schuld :) Ich hab Palmin genommen, vielleicht probiere ich einfach beim nächsten Mal das von Rapunzel aus. Ich hab den Kuchen mit allem drum und dran dann in den Kühlschrank gestellt, das hat ein wenig geholfen. Und ja, vielleicht war auch mein Pudding noch zu warm. Naja, beim nächsten Mal wirds besser. Ah, ok. Palmin habe ich noch nie benutzt. That is wonderful! Thank you for trying the recipe! This is in my oven right now! Yes, I agree. The original versions are definitely a lot richer. wow. that sounds incredible! never thought about the c / k usage in German. I’m quite happy you rushed to D! I like the looks of that batter recipe. This looks so beautiful! And it’s full of all of my favorite flavors. I have never tried to make a buttercream like this before, but it’s definitely going on my to do list! This sounds great! Wish I’d come across it (in vegan form) when I was in Germany last week! Such a beautiful cake! This would be a spectacular dessert for any occasion. The combination of chocolate, vanilla and cherry, and all those different textures sounds so divine! So this is already my favorite dessert ever, I can tell. I cannot wait to make this. It looks incredible! Oh my goodness, I ate a piece of this cake (well, not this exact cake!) in Zagreb and it was so amazing that I got two more pieces to take away! I wish I could make it now but sadly it’ll have to wait until I’m back from San Francisco, rest assured that I WILL be making this as soon as I land. This cake looks sooooo good, I love chocolate and cherry desserts. I feel like I’ve been missing out by not familiarizing myself with German desserts! Oh wow! What an amazing creation. I am loving the opportunity to learn so much about German desserts. I absolutely love these flavors together… Especially the cherries in there! I need to send this link to my mom! She’s going to love it too. It looks great, C.
OK, so this has to happen in my kitchen soon! Can I just clarify what you mean by very soft coconut oil? Do you mean room temperature? Or warmed up to be not quite melted?